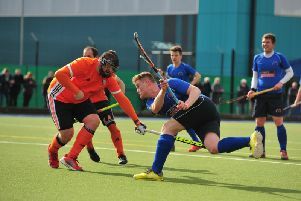 Harrogate Hockey Club Ladies 1sts suffered a narrow defeat on the road at Bowdon 2nds. Rachel Till’s team went into their North Division One game on a high following a comprehensive home win over Lymm in their previous outing and this showed in the opening play of Saturday’s encounter. ‘Gate piled on the pressure despite the heavens opening, but failed to convert any of the chances that they created. Bowdon then took the lead just before half-time, finding the net via a deflection off a ‘Gate stick following a scrappy bit of play. The second period was also an evenly-contested affair with both sides creating chances but the visitors managed to keep their hosts at bay thanks to some solid defending, notably by player of the match Laura Beardsmore. ‘Gate pushed right until the final whistle, but were unable to get back on terms. The Ladies 2nds were beaten 3-1 at Ainsty Road by Selby 1sts. Harrogate 3rds travelled to City of York 4ths and came away with a 2-1 success. From the pushback they created several clear openings, only to be denied repeatedly by York’s inspired goalkeeper. The match remained goalless until the second half when a fine penalty-corner shot from Maggie Pimley found its way into the bottom corner. Pimley then followed this with a second goal after some fine work down the left-hand side from Sonja Morgan and Gaby Wilkinson. York reduced the deficit with a breakaway goal, but ‘Gate held on for the win. Claire Turner was the victors’ star performer. The Ladies 4ths picked up a hard-earned victory over Horsforth 1sts courtesy of an Ella Ralli strike 10 minutes before the final whistle.